Samsung's latest high-end phone is solid, but it's also expensive and lacks eye-popping new features. Samsung's new 'phablet' comes in bright new colors and with a stylus that can be used as a remote control for different purposes. Outside of a decent battery upgrade, Samsung's Galaxy Note 9 feels like a poster child for the challenges facing high-end smartphone makers in general, and high-end Android vendors in particular. That doesn't mean the Note 9 is a bad phone, by any stretch. It just means that it's the product of a company that seems resigned to seeing lengthening smartphone upgrade cycles amid a lack of eye-popping new features, and is hoping to make up for it by charging more to those consumers who do choose to upgrade. The Note 9, unveiled at an NYC event on Thursday morning and due to become available on August 24, looks quite a lot like the Note 8. Its OLED display is fractionally larger (6.4 inches versus 6.3 inches), and its processors have been upgraded -- depending on the model, the phone uses either Qualcomm's (QCOM - Get Report) Snapdragon 845 or Samsung's Exynos 9820. The phone also features a camera setup similar to that of the Galaxy S9 Plus, including the ability to switch between a wide-angle rear camera and a primary rear camera that itself can switch between two apertures. 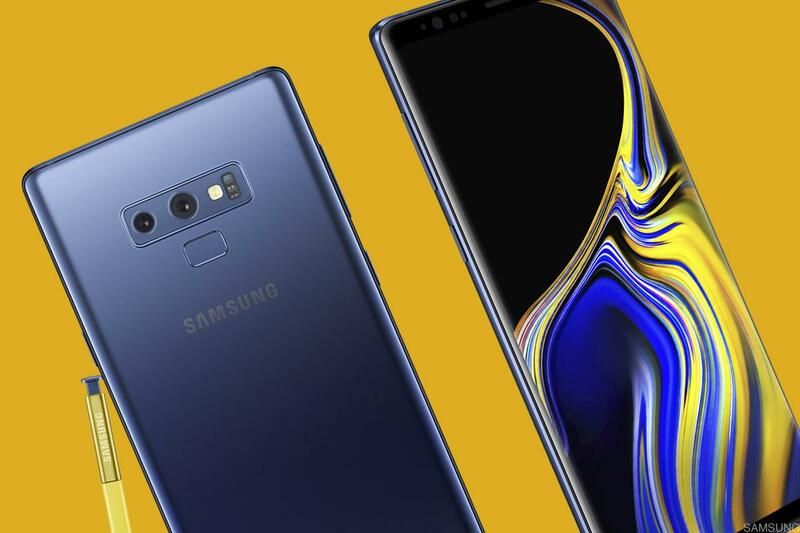 The Samsung Galaxy Note 9 has a longer-lasting battery and a slightly larger screen than its predecessor. Samsung also put a Bluetooth Low Energy (BLE) radio inside of the Note 9's S Pen stylus; among other things, it can be used to launch apps and trigger the camera shutter. The phone also comes with a water cooling system meant to prevent overheating (cue the Note 7 jokes). And like some rival Android phones, the Note 9's camera app has an AI mode that attempts to optimize a shot based on the objects a camera is seeing. However, relative to the Note 8, arguably the biggest upgrade is a pretty mundane one: The Note 9 packs a 4,000mAh battery that's 21% larger than its predecessor's, and also 14% larger than the S9 Plus's. Samsung is hardly the first phone OEM to put a battery of this size on a phone -- Huawei has launched high-end phones with 4,000mAh batteries, and Lenovo's Motorola Mobility unit actually put a 5,000mAh battery on its mid-range E5 Plus phone. Still, it's a welcome upgrade for the power users that make up much of Samsung's Galaxy Note base. With all that said, however, there isn't much of a "wow factor" here. Among high-end Android users who already own a phone featuring good cameras, a modern processor and a quality display in the 6-inch range, and who on average have been waiting longer to upgrade, the Note 9 will generally be a tough sell. And that's particularly true given its pricing. Whereas the Note 8 -- only available with 64GB of storage and 6GB of RAM in the U.S. -- was priced between $930 and $960 at major U.S. carriers at launch time, a base version of the Note 9 featuring 128GB of storage and 6GB of RAM will sell for $999, and a premium version featuring 512GB of storage and 8GB of RAM will sell for $1,250. The base version's price is also well above the S9 Plus's $840 launch price, and is of course on par with the iPhone X's base price. As an aside, the steady increases seen in RAM and storage capacities for high-volume smartphones is a positive for memory makers such as Micron (MU - Get Report) and -- as far as flash memory goes -- Western Digital (WDC - Get Report) . Samsung generally uses its own memory within its phones, but its rivals naturally have to tap an outside source. The Note 9's pricing suggests Samsung isn't bent on halting its recent unit sales pressures: Research firm IDC estimates Samsung's Q2 smartphone shipments fell 10.4% annually in Q2 to 71.5 million, leading its unit share to drop to 20.9% from 22.9%. Samsung, for its part, reported its mobile revenue fell 22% in Q2 to $20.4 billion amid sluggish Galaxy S9 sales, and forecast "new model launches and intense price competition" will continue weighing on its phone business in the second half of 2018. Apple (AAPL - Get Report) , which has been seeing limited iPhone unit growth but healthier high-end iPhone demand, is one culprit here. However, China's Huawei and Xiaomi, both of which were estimated by IDC to see 40%-plus smartphone unit growth in Q2, have also become headaches. And to some degree, so has Alphabet/Google (GOOGL - Get Report) and its Pixel phone line. Against this backdrop of tough competition and longer upgrade cycles, Samsung seems more interested in boosting its high-end average selling prices (ASPs) and margins than its volumes, wagering that high-end buyers who have already been signaling a willingness to spend more on new phones will continue to do so. The reception seen for the Galaxy S9 and S9 Plus might be influencing Samsung's thinking here. Though the flagship phones were priced relatively aggressively (the standard S9 started at only $720 at launch time), this clearly didn't do a whole lot to boost shipments. It's possible that new innovations -- foldable phones, perhaps? -- will change the rules of the game down the line, leading upgrade cycles to contract and motivating Samsung and others to sacrifice their high-end margins a bit in the name of driving volume growth. But until that happens, a product launch like the Note 9's feels very much par for the course.